…late at night on a fridge…. On the scale of world issues, it is not great (I get weary of middle class members of middle England obsessing of how stressful their lives are with all the shuttling they ‘have’ to do getting their little treasures between ballet, horse riding, tuba lessons and their extra tuition in dance, plastercine expression and bycycle cleaning)… but I hadÂ a ‘mare of day yesterday…. pc crashes, helpline snarl ups, kids homework, interminable GCSE marking, mediating between major world powers etc. …and I smiled. Being spiritual is not about having the warm fuzzies…. maybe it has more to do with noticing the God who is already there in the midst of wanting to strangle the cat (and I don’t even have a pet). Author GrahamPosted on June 30, 2009 Categories randomLeave a comment on …late at night on a fridge…. …and all I have energy for is a cartoon (that is partly because yesterday was a good day. Springsteen may have managed 2h 40 at Glastonbury…. 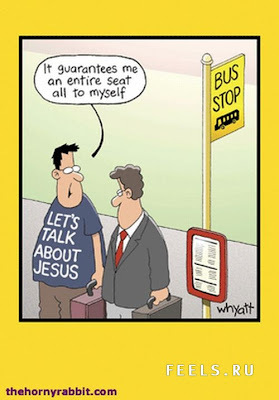 bet he couldn’t do 2 ‘full on’ services, although maybe he might get bigger crowds than I do…). This one is from the effervescent and ever controversial, ‘Of Course I could be wrong’. I use powerpoint quite a bit in one of my churches- this is for a very deep reason: it’s there. I’m not always happy about it- no medium is ‘neutral’- it affects the message. I think I’ve moved away from the default position of ‘Powerpoint during sermons’ ie ‘The word made flesh, made back into lots and lots more words; all in Times New Roman’ (Don’t get me started on the use of Times New Roman…. I’ll just get on one of my (many) hobby horses.…). So I try and juxtapose (love that word; it sounds so cool- I’m not exactly sure what it means) images that may not always be direct. Author GrahamPosted on June 28, 2009 Categories UncategorizedLeave a comment on I’m using this today……. (That masthead would be incomprehensible to anyone outside of Britain….. google ‘Fawlty Towers’ ….and you may still be bemused). I live in the country- that is fantastic- I was born in a city. I am like most city dwellers when it comes to the country: I expect it to be green, clean and peaceful. In 5 years here I have discovered that it isn’t; it’s a place where people work, it is noisy and smelly…and I am so fortunate to be here. It took a while. When I first came here I could just about tell the difference between animals and humans (and on my dark days, that is still hard). I have gradually learnt to tell the difference between different types of animals. So far, we have had rabbits, mice, 87 million flies, various birds and pheasants (ok I know pheasants are birds, but I thought you’d be impressed) in the back garden. On Thursday at 6.30am I had 2 large, stray horses in the garden. I phoned the farmer who lives across the fields. ‘Describe them’ she said. I know a lot of words about a lot of things, but not horses. My descriptive powers when it comes to horses are ‘Four legs……err that’s it’. After a conversation that had all the shared understanding of one between a GlaswegianÂ tap dancing instructor and a Welsh-speaking structural engineer, we worked out that they weren’t her horses. I’m thinking…. horses…large four- legged things- just how many stray horses can there be at 6.30 in the morning in my area of the village? Regular readers of this blog (yes that is you….the one in the stained rain mac, the purple flares and string vest carrying ‘trainspotters monthly’…pay attention), will note my aversion to the word ‘success’. In fact I blogged a bit about it last week. I worry what a church that describes itself as a ‘success’ is actually like. I worry about the pressure of ‘success’- if you don’t feel succesful, just broken, is there a space to admit it? If numbers fall or something stalls, can you admit it? I don’t see the word ‘success’ in the New Testament. I am not denying that things can flourish for a while, grow incredibly, large numbers come to follow Jesus etc etc. I long for things like this and I’ve seen them (sometimes). Donâ€™t wait to start. Donâ€™t wait to be perfect. Donâ€™t wait to be good at it. Donâ€™t even wait to be average. Pretty well everything that is really and deeply important in life is worth doing, even if the best you can do is to do it badly. Get stuck in. Get your hands dirty. Get your nose bloody. Do it with all your heart and strength even if that is only good enough to do it badly. Jesus told us to do lots of things. I am bad at almost all of them. But Iâ€™m going to do them, even if I make a fool of myself in the process. Iâ€™m going to love God and you and other people. Iâ€™m going to pray. Iâ€™m going to give lots away. Iâ€™m going to give up destructive living. Iâ€™m going to resist evil. This is from an American Episcopal Priest (HT: http://jonnybaker.blogs.com/jonnybaker/)Â whoÂ came to Britain and interviewed Anglicans- Bishops, Vicars and the hoi polloi. He asked them if they could have done anything differently to cope with the rising tide of secularism 20 years ago what they would do then and what they would do now…. So, (several of them concurred) if we could go back â€“ if you could learn from us â€“ we would encourage you to take action now; do not wait until you have it figured out. Invite faith-filled young leaders into your communities. Listen. Try on new ideas. Experiment. Be willing to fail â€“ often and early. â€œFail awayâ€ until patterns of meaning start to emerge from your communities in discernment. Listen for the Fresh Expressions of the Spirit in their sometimes awkward and clumsy offerings. Especially listen and observe the way they use ritual and music to make sense of the insanity of our lives. Neither quote sounds ‘succesful’ does it? Author GrahamPosted on June 26, 2009 Categories church, missional, quotations2 Comments on It’s a success! Ok, I know that the most neglected organ that we Christians have is the brain, I know we need to grapple with issues. It is just that…..
…..well sometimes the way I have seen debates conducted (the bile, name calling etc) and the way they can lead to over-cerebrality (if that is not a word then it should be) makes me think sometimes ‘And this is following God?’. The very fact that this controversy is so often approached as a debate about â€˜theoriesâ€™ of atonement has the effect of confining us to a rationalizing, modernist mentality that will inevitably miss the point. There is no theory of atonement â€“ there are no theories of atonement â€“ in the New Testament. What we have is a story about how the people of God found a means of escape from the historical impasse into which they were being driven by their persistent state of revolt against YHWH..
..What we cannot do is discard the narrative-historical setting as though it were merely the husk around some essential theory of atonement. Indeed the opposite is true: the narrative is at the heart of the matter, the theology is merely interpretation. Evangelicalism will not settle the debate over the atonement, in my view, until it grasps the fact that not only is it the product of the narrative, it remains subject to the narrative. As long as it insists in dealing with abstractions, it remains a sub-biblical movement. A tragedy happened in one of the villages where I have a chapel. What do you do when you feel powerless? Feeling powerless when in ministry is a good thing: you can’t control anything or use ‘assumed competence’. This chapel is tiny; there is a feeling that it may not have a long term future. But it responded and acted rapidly: opening it’s doors to the community at a time when the school (next door to the chapel) closed for the day and inviting people to a quiet space in the name of the school and the 2 village churches. Background music played, people came and went and lit candles and wrote prayers. Many people, whose connection with church/chapel/formal expressions of faith is tenuous came in and felt grateful and ‘connected’- if only for a moment. If all they remember was the hospitality then that would be enough. Me? I’m grateful that they had the confidence to do this and I’m wondering on the 2 Sundays a month when they do not have formal worship that this might be a way forward. Full story here:- http://www.gazettelive.co.uk/news/teesside-news/2009/06/23/ingleby-arncliffe-villagers-in-prayer-vigil-for-margaret-84229-23949402/(although I’m not sure how long the link will last). I spent a couple of hours the next day ‘hanging around’ the school…being in lessons, playing and talking at break (and once bowling a mean medium paced off cutter- ok it was against an 11 year old, but I can still dream...) and sitting and waiting. A teacher said…. could you do this more often. I’m talking to the local vicar in a few weeks and seeing if we can do this between us once a week…..
For many years now I have had an unreasoning hero-worship of Eric Cantona. He is my favourite footballer of all time and more. When I managed a housing office in a past life, I even coded the alarm with his birthdate. When ‘that kick’ happened, it did not dim my faith. I wasn’t disappointed. It was fantastic. Probably slightly more sweary than the average church council, but brilliant. I want to watch it again and again. So much in it (the title itself: ‘Looking for Eric’ has a double edged meaning), so many themes of community and redemption, working class pride, football as religion….so refreshing to see an explicitly male film…so refreshing to see a good, low budget British film…………….Â but also so much Eric Cantona. I can only say ‘Oo ar Cantona’. Things financially around here are not as tight as they have been for the last 8 years or so. Ok- I’m not quite in the Ronaldo bracket (neither have I slept with Paris Hilton to my knowledge) and holidays take a bit of financial juggling, but I can buy essentials (wine, cds, books, concert tickets, wine and wine) without planning carefully in advance. and it would be so easy to press ‘buy now’….. but I’m thinking of some good folks in Africa whom I have prayed for for 3 years and never been able to support financially before….. and I don’t know. To paraphrase a recent blog entry quote- it is easy to just live a more religious version of suburban, consumerist life…but I want more that that…….. But my finger is still hovering above ‘buy now’….. Author GrahamPosted on June 22, 2009 Categories Eels, music, Q, The Divine Comedy4 Comments on It is so easy…. My five year old did this. I love it. It is his version of ‘The Gingerbread Man’ if ever I get to form a band, I will call it ‘Bread the Gunger’: nothing else gets close (although I read Psalm 119:83 this week and I quite like ‘wineskin in the smoke’ as well). It made me think about perception- he is totally convinced that this is ‘right’. One day he will realise that it is different; although I hope he will never lose his surrealism. I wonder how many things I think are ‘right’ and can never be changed that are really just me?